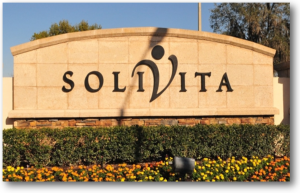 Search the Solivita Over 55's Active Adult Community in Kissimmee, Florida - Frontline Florida Realty Inc. The Solvita resort, is an award winning, top voted resort, located in Kissimmee, Florida. There is a reason why this resort has won over 70 awards and has been named one of the nation’s Top 50 master-planned 55-Plus communities by Where to Retire Magazine – Solvita is an innovative community, leading the way for excellence in community planning and building environmentally sustainable communities for the over 55’s. The Solivita community provides residents both an ideal location in the right in heart of Central Florida’s attraction zone and a peaceful resort setting with the resorts 4,300 acres. Soltiva offers residents the flexibility of being in close proximity to all the area attractions, shopping malls, restaurants and other point of interested, combined with first class activities and amenities within in the resort itself. Solivita is located just minutes from tranquil downtown Kissimmee, FL and less than 30 miles from the parks of Walt Disney World® and Orlando International Airport. Solivita’s Tuscan-inspired homes are attentively designed with over 55’s in mind. With open floor plans, attached garages, fresh looking kitchens, covered lanais and more, you’ll be sure to find a floor plan to fit your needs as there are 15 to choose from! 2 bedrooms, Avellino model built with den, 2 bathroom and an attached 1.5 bay garage. Square footage: 1,361-1481 sq. ft.
Square footage: 1,582 – 1,719 sq. ft.
2-3 bedrooms, den available on some models, 2-2.5 bathrooms and attached 2 bay garage. Square footage: 1,707 – 2,259 sq. ft. There are additional models available through resale only, please scroll down to the bottom of this page to view current listings. The Solvita resort has been designed so that all residents can easily navigate the resort by walking, cycling or driving a golf cart to the various amenities and activities the community offers. From the state-of-the-art clubhouse, various sports courts, the spa and fitness center, attending social clubs, taking a class or just relaxing by the pool – there’s always something to suit your mood. Solvita is most certainly a ‘go-to’ community for the avid golfer, the resort offers two stunning championship golf courses right on your doorstep! The resort has a full-time on-site Activities Director and Lifestyle Team who are devoted to offering a wide variety of events and social clubs to meet the diverse taste of Solvita residents.